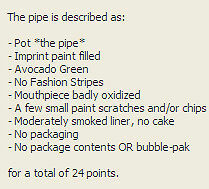 The value of pipe #147 is 24 points. This pipe was part of a lot being offered on eBay. Baker Egerton told me it was there. The price for the lot was too high for me so I waited until Larry Yeager won the bidding and then wrote to him offering to buy just this one. He kindly sold it to me. This is my third Made in England pipe. The others are a briar and an Ebony. Not, strictly speaking, something I am collecting, but it is interesting. Slightly smaller than those made in the USA, this is the only Avocado Green Pot I have so far. It's amazing the difference a few years can make! Now I have a US Avocado Green Pot as well as one of these MADE IN ENGLAND un-smoked in its in original packaging. Therefore this excellent specimen will go the Pipes for Sale or Trade page. I'm not going to smoke it, though, because it is really in great condition and someday, someone will want it for a collection and I don't want to degrade it. Daniel Waddock, wanted an example of each marque and bought this one to complete his collection of one each the pipe, THE SMOKE, Venturi, and the pipe - Made in England.